The Cuisinart Pizza Oven fits neatly on your countertop. It features real bricks inside to ensure even heating to make terrific pizza. The oven also comes in handy for baked apples, casseroles, cookies or other baked goods. You can even broil with this oven and make excellent broiled shrimp and steak. This is a perfect addition to the kitchen for a single or small family. The Cuisinart pizza oven heats very evenly. It works well for almost everything you could make in a normal oven. The light is nice and bright, which makes it easy to check on your food. The baking stone that is included helps make a terrific pizza. The convection fan is also very quiet. The unit allows you to cook all sorts of foods in the heat of summer without overheating your kitchen. The oven uses less electricity than your standard oven. The Cuisinart pizza oven lacks a temperature gauge. This probably isn't a big problem except in the few units that seem to just keep getting hotter and hotter. Unless they are observed when in use, you may not catch that and end up with a fire. Even on units that work properly, the exterior gets very hot, so be careful. When the light bulb burns out, it is not easy to change it. The drip pan warps when heated. At this price, they could make this tray out of a better quality metal. The oven is a little small for some meals. Roasted chickens must be smaller birds than you may wish to make. The print around the dials tends to rub off after a short time. There is also no built in timer for your baking. The Cuisinart pizza oven works really well. If you have enough space on your counter top to let the air circulate around it, you should have few problems. The exterior gets very hot, so you want plenty of space to let the heat dissipate. Always keep an eye on the oven when it is in use. If you don't have room for a standard oven, this little gem could be perfect for you. 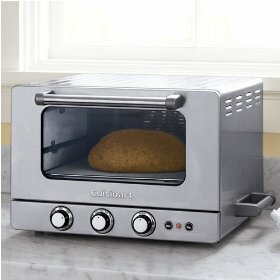 It will make delicious meals; you can bake bread, pizza and desserts with ease. You may need to find pans that will fit easily within the small cavity of the oven. Be sure to pick up a timer for this oven so you know when your food should be done.